Canadian French for reindeer, from the Mi’kmaq word ‘qalipu’ for reindeer meaning snow-shoveller, after the behavior of the animal in scraping through the snow to find food. First known in Canadian French in the mid-17th century. Also, a drink popular at the Carnaval de Québec, made of a mixture of red wine or port and hard liquor and sweetened with maple syrup or sugar. See Wikibec, Wiktionary, and Carnaval de Québec. 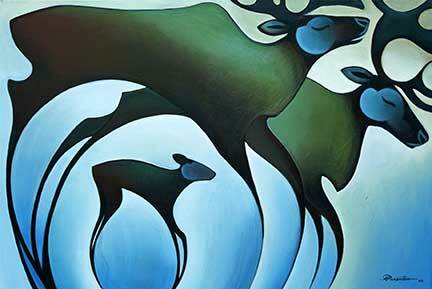 For information about the artist, see Nathalie Parenteau.